Halsey has surprised her fans around the globe today, as the ‘Bad At Love’ singer extended her headlining tour by announcing its final legs throughout Australia, North America, Latin America, Asia and more. 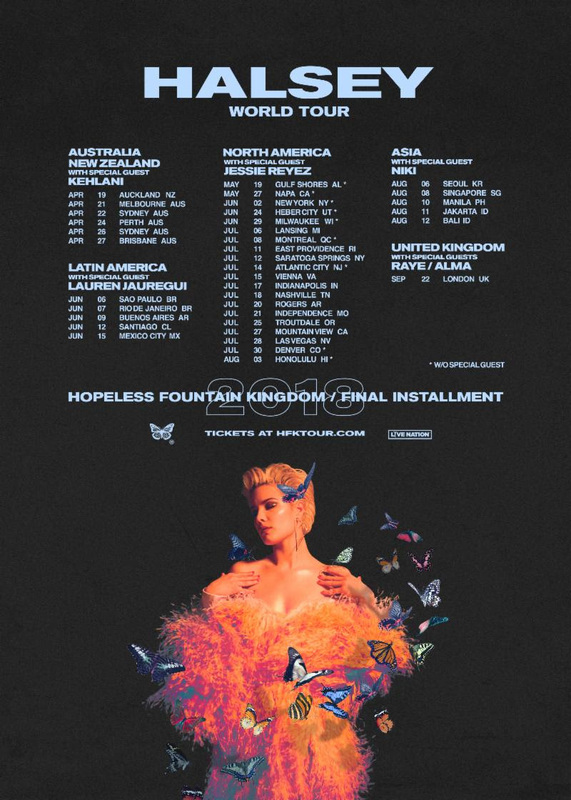 Dubbed the “Hopeless Fountain Kingdom / Final Installment”, Halsey will kick things off on April 19th in Auckland, and will make stops in Sydney, Rio De Janeiro, Singapore, Milwaukee and more, until things come to an end on September 22nd in London. And Halsey will not be alone either, as she will be joined by Jessie Reyez, Kehlani, Lauren Jauregui and more! Tickets for the North American dates will go one sale for the general public on Thursday, March 29 at 10AM (local time) at LiveNation.com. Fans can visit HFKTOUR.com for more info. Peep Halsey’s world tour dates below.